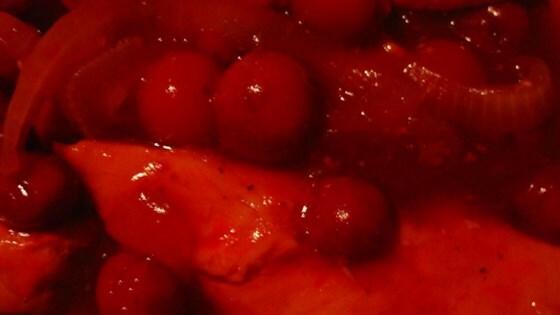 "Chicken breasts lightly broiled, then baked with a cherry juice/brown sugar sauce, brandy and cherries." Lightly brush chicken breasts with melted butter and broil for 2 to 3 minutes each side, or until just lightly browned. Place browned chicken in a 9x13 inch baking dish. In large bowl combine the reserved cherry liquid, sugar, chile sauce, water, Worcestershire sauce, onion, raisins and salt and pepper to taste. Mix all together and pour mixture over chicken. Cover dish and bake at 325 degrees F (165 degrees C) for 1 hour. Remove cover, add cherries and brandy to chicken and bake uncovered for another 15 minutes.